Jake Noviello (pictured) is the heart and soul of a Franklin team that is proving everyone wrong. On Memorial Day, Jake Noviello toed the rubber fully knowing that Franklin’s dreams of a Super Eight appearance hung onto his right arm. The right-hander had been waiting for this opportunity for four years and he stared at in the final athletic season of his high school career. It was a chance that the competitiveness in him was never going to let fly. 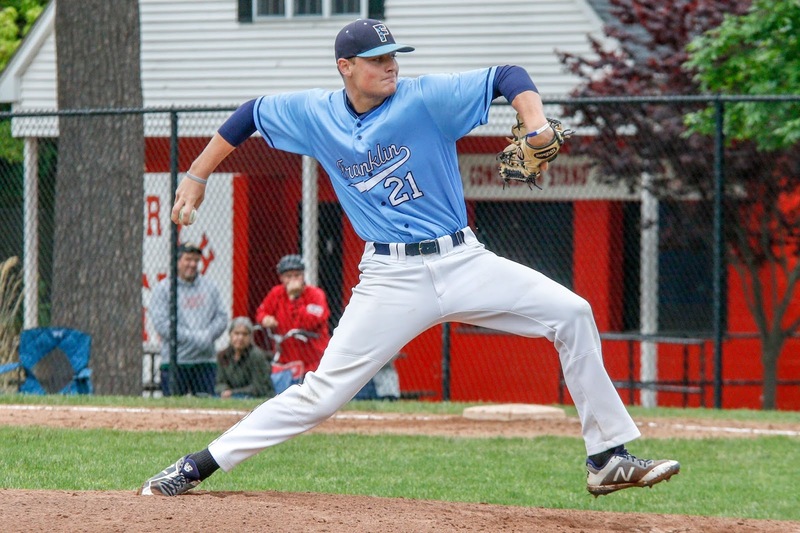 Noviello turned in one of the finest performances of his career going eight innings allowing just one run on six hits while striking out a dozen in a 6-1, nine-inning Franklin win over North Attleboro. As Noviello walked off the mound for the final time he pumped his fist as he had done numerous times prior. The face of the program had just led them to history. The Providence College baseball program may have discontinued in 1999, but the influence on the Noviello family in Franklin remains. Long before becoming the ace of the Panthers' staff, Jake heard stories from his father Tony about his time as a member of the Friars pitching staff in the late 1980s. Those stories soon translated into Jake's own dream. After spending most of his freshman spring on the junior varsity team, Noviello got time with the varsity squad as the season came to a close. Less than ten months later, Noviello was the Panthers’ opening day starter versus Oliver Ames. Standing at six-feet three-inches and just over 150 pounds, Noviello labeled himself as a ‘string bean’ as he retained relatively high velocity but struggled with his command. Radar guns began to appear at college showcases he attended but the results were less than inspiring. Noviello received feedback from colleges that he had the artillery to become a college pitcher, but that he needed to build up his frame and work on his control in order to reach the level he was striving for. Prior to the spring of his junior year, Noviello began attending Cressey Performance. He increased the size of his lower body and shot up from 170 pounds to almost 195. His velocity increased, but so did his knack for pitching as he became enamored with one of the best control pitchers to ever step foot on a Major League mound. Alongside catcher Jake Macchi, Noviello retooled himself slightly as a pitcher relying not so much on the fact that he could touch close to 90 miles per hour, but more on his pinpoint control on both sides of the plate. It was not longer about how hard he threw but knowing that every pitch he fired in was the right one as long as he could place it wherever Macchi set up. Most importantly, however, Noviello combined his desire to win with his love for pitching. An outwardly fiery competitor, Noviello displays his demeanor on a pitch-by-pitch basis finding a spark of emotion for every strikeout he piles up. Heading into his senior year Noviello added another 20 pounds, bringing his total build to six-feet five-inches and 215 pounds. He often towers over hitters mixing his 87-90 mile per hour four-seam fastball, changeup, and curveball to fool whatever lineup he may be facing. For his senior season, the right-hander is 6-2 with a 1.58 ERA. He has struck out 57 in 57.2 innings while allowing just 43 hits. Around the practice field Noviello is often energetic and relaxed, willing to pull the occasional prank on a fellow teammate. He was the Panthers quarterback in the fall, and his throwing arm and performance led to interest from a handful of IVY League programs. Noviello’s charisma, personality, and love for baseball kept him focused on becoming a weekend starter at a Division 1 program. He found that in Fairfield. Yet his urge to begin his career at Fairfield is impeded by a lone obstacle – the opportunity at a Super Eight championship. Led by a classic Noviello start on the mound the Panthers got past No. 2 Wachusett in the opening round. Four days later against No. 3 St. John’s Prep, Noviello found himself at third base where he often plays when not handling the starting pitching duties. After seven stellar innings from Bryan Woelfel, and 1.2 innings of relief from Jason Ulrickson, Noviello was called upon by Brown to handle a one-run Panther lead. With a slot in the Super Eight semifinals on the line Noviello did not back down and induced a groundball to second base to complete the upset. Franklin will now turn its attention to Wednesday night’s showdown versus Central Catholic with a spot in the Super Eight Final on the line. Franklin’s ace is expected to get the start and if the past is any indication he will carry the same mentality to the mound that he has for the past four seasons. By week's end, however, the Panthers are hoping that Noviello’s final walk-off on the mound does not involve a fist pump but rather a jump into Macchi’s arms.